Seven men, including spiritual leader Rehman Jr., were arrested on terrorism charges among other things, after the judge lodged a complaint via the motorway police’s helpline. When news of the arrest spread among followers of Rehman Sr. and Jr., a large number of their followers assembled at the police station. Influential political personalities, Ministers and other high ranked government officials then approached both parties for reconciliation. On 3 June Rehman Jr. was released on bail, after his father Muhammad Naqeeb Ur Rehman agreed to write an apology letter that was to be published in all print media and paid ₹1.000.000 (± €13.000) to be donated to welfare organizations. Last year, Muslim clerics Rehman Sr. and Jr. made the headlines after @sheikhwatch broke the news that these glorifiers of Muslim terrorist Mumtaz Qadri were welcomed at Lambeth Palace by Justin Welby, the Archbishop of Canterbury, before they started their annual summer tour of the United Kingdom. But even being exposed as clerics who glorify terrorism, didn’t stop them from showing up again. Quite the contrary. Yesterday, they landed at Heathrow Airport to start their annual winter touring of the United Kingdom, which will kick off tonight in Slough. Accompanying them will be five Pakistani reciters who all also have in the past glorified Islamist murder. Saturday the 9th of December, the father and son duo will be welcomed to preach in The New Bingley Hall in Birmingham, accompanied by even more reciters who spoke out in favour of the terrorist from their native Pakistan. 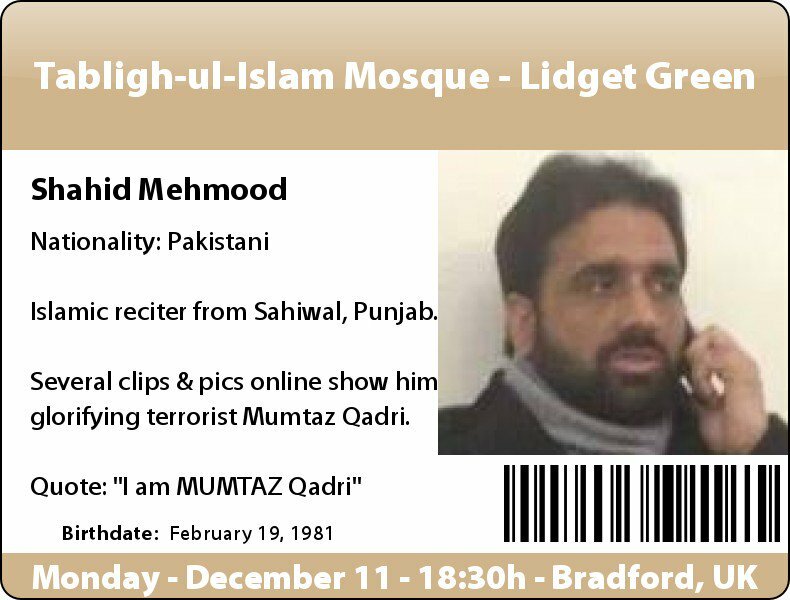 Update: Monday the 11th of December, Rehman Jr. & Sr. will be allowed to preach in the Tabligh-ul-Islam Mosque in Bradford, accompanied by Pakistani terrorist glorifier Shahid Mehmood. 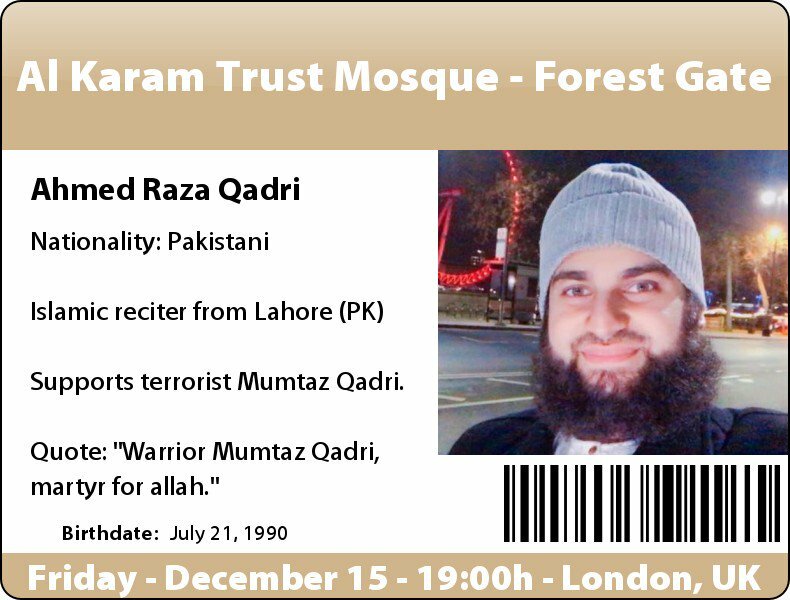 Update: Friday the 15th of December, Rehman Jr. & Sr. will be allowed to preach in the Al Karam Mosque in London, accompanied by Pakistani terrorist glorifier Ahmed Raza Qadri.